There isn’t a store bought bath puff that can compare to my super fluffy version. It is made with 100% cotton yarn and oh so soft against my skin, but for extra scrubbing power, add some nylon netting. I dislike how my bath puffs always wear out so hopefully this one will last a long time as it is ten times more durable then the ones I used! I think I will make a few as gifts. Here is the pattern if you would to like to make one, even a beginner can do it. Also, check out the cotton yarn experiment post, since this bath puff is a part of it. Finish off weaving end into bath puff. Row 1: ch 30, sl st in first ch made forming loop, attach to center of bath puff. 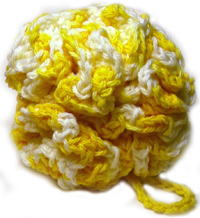 If you need help crocheting this bath puff, let me know and I would be glad to help! This entry was posted on Thursday, April 30th, 2009 at 6:01 AM by Rachel Choi	and is filed under Free Crochet Patterns. You can follow any responses to this entry through the RSS 2.0 feed. You can leave a response, or trackback from your own site. If you do a magic circle – that would make it big enough to put in the 30 DC and then close it up once you are done. I will be trying this pattern this week-end. I agree with above that it will probably last longer than those store bought ones. Thanks for the pattern. Do you still like this as a bath puff? I know how to crochet. I just am not good with written crochet directions. I’m not understanding. So, I crochet 3, but where do I put 30 double crochet stiches? I’m totally lost. The 30 dc will go into the third chain from your hook, which is the very first chain that you made.